(Chicago, IL) Modern Process Equipment (MPE) is excited to announce the launch of their new website at www.mpechicago.com. 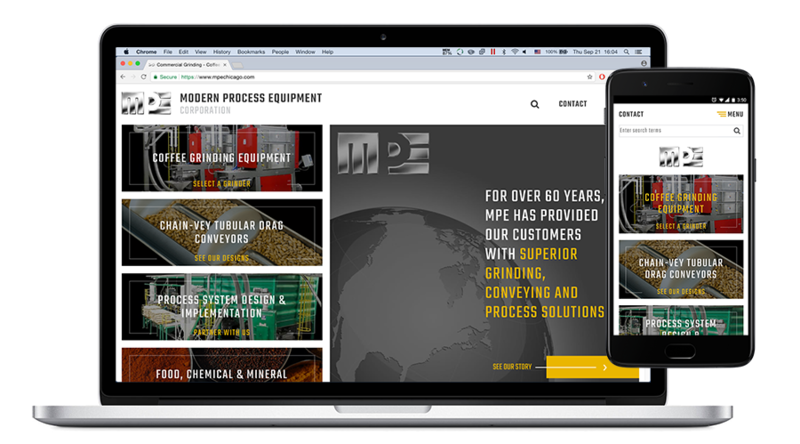 As the world’s leading manufacturer of industrial coffee grinding equipment, conveying equipment and plant process systems, MPE wanted to create a site to support their global market presence with a new look, interactive features, robust content and mobile responsiveness. For coffee producers, MPE created an efficient "one stop shop," the dynamic Grinder Finder tool, wherein users can find their ideal grinder based on personalized criteria. For food producers interested in a transport method that can move their products efficiently without compromise, a visit to the Chain-Vey section of the site will quickly inform them about the advantages of Chain-Vey versus other conveyor systems. Additionally, a revamped News and Case Studies section highlights MPE’s work with major coffee and food producers on the design and implementation of complete process systems. MPE invites you to visit www.mpechicago.com to discover more beyond these selected features, and also welcomes you to contact the MPE sales and engineering group anytime at solution@mpechicago.com or 773-254-3929.